An ultra-lubricating cream that delivers a super-close shave that wonÕt leave skin feeling sore. It helps skin recover from damage while preventing aggravation brought on by shaving. Contains no artificial fragrance or color. 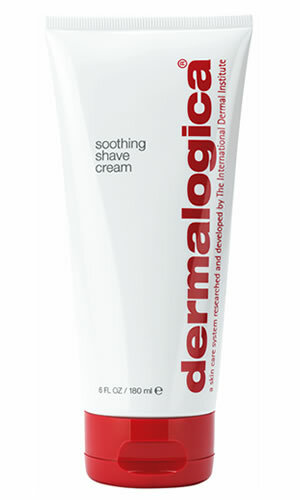 Dermalogica Soothing Shave Cream Key Ingredients. Aloe Barbadensis Leaf Juice, Allantoin, Symphytum Officinale (Comfrey) Leaf and Panthenol (Pro-Vitamin B5): soothing ingredients that aid in skinÕs post-shave recovery process. Tocopheryl Acetate (Vitamin E) and Sambucus Nigra (Elderberry) Flower: skin smoothing antioxidants help defend against skin-aging free radicals. Simmondsia Chinensis (Jojoba) Seed Oil and Butyrospermum Parkii (Shea Butter): provide superior softening and conditioning. Saccharomyces Cerevisiae (Yeast): an extract and rich source of vitamins, enzymes and proteins that stimulate wound healing, collagen formation and an increase of oxygen utilization in cells.